Please read our Terms and Conditions before booking our services. By booking our transfers or services the customer fully accepts our Terms and Conditions, and he/she is therefore legally bound to them. This User Agreement is regulated by the Italian law regardless from conflict of laws that would result in the application of the legislation belonging to any other jurisdiction. www.cataniaairporttransfer.com or the transportation service provider shall not be held responsible for losses including, but not limited to, loss or stolen properties, lost or damaged luggage, missed flights, ferries or trains or any other missed connected services, for whatsoever reason. www.cataniaairporttransfer.com or the transportation service provider shall not be held responsible for any direct or indirect damage due to omissions or mistakes affecting the booking, either made online or by phone or by email. The customer shall be the only responsible for the information reported in the confirmation email; any mistakes or omissions shall be immediately communicated to the booking office, and a new confirmation email will be sent shortly. Any mistakes or omissions detected 48 hours before the agreed pick-up time shall be communicated to the phone number provided in the confirmation email. By subscribing this User Agreement, the customers acknowledges that www.cataniaairporttransfer.com shall not, in any way, be held responsible for whatsoever loss, expense, direct or indirect damage due to the use or missed use of the booked transfer services, under ordinary and extraordinary circumstances, even if www.cataniaairporttransfer.com has been informed about some particular circumstances affecting the customer's trip. After the booking procedure, the customer shall get our service confirmation by email. If no vehicle is available, our company will inform the customer by email. The vehicle model and type reported on the booking form and on this website re only aimed at describing the type of service. In some few cases the service provider could decide to use a different vehicle for the transfer service, for example if the reserved vehicle is in delay because of traffic, diversion or other reasons, a suitable vehicles shall be provided at same or at a higher price. The company cannot guarantee that the same vehicle type or model reported in the confirmation email shall be provided for the service. The usual payment method is in cash to the driver, but it is anyway possible to make a payment in advance by Paypal or credit card via Paypal (by adding a 4% fee). No need to have a paypal account if the customer wants to pay with credit card. When the Paypal page opens it is possibile to select PAY WITH CREDIT CARD. If the customer chooses to pay in cash to the driver, the credit card details provided during the booking procedure shall be only used to confirm and guarantee his reservation, but no amount will be debited on the credit card. The customer's credit card may be used to debit, without previous notice, any applicable penalty and to cover any expenses in case of damages to the vehicle. The customer acknowledges and confirms that the credit card number provided during the booking procedure refers to his own credit card, and that it has sufficient funds to pay for the transfer. b) 100% of the transfer cost after the driver has left to reach the agreed meeting point or in case of customer's "non-show"
a) Pick-ups from airports and cruise terminals: 60 minutes from the actual flight or cruise arrival time (displayed on the airport/cruise terminal screens). After this time, if the driver is not contacted by the customer, the driver shall leave the meeting point. A cancellation fee (100% of the booked service price) will be charged. b) Pick-ups from any other location: 30 minutes after the agreed pick-up time. ). After this time, if the driver is not contacted by the customer, the driver shall leave the meeting point. A cancellation fee (100% of the booked service price) will be charged. If the "non-show" is not communicated by the customer, and if the maximum waiting time has passed, 100% of the booked service price shall be charged. Any modification to the service booked shall be communicated to our reservation office by email at least 48 hours before the pick-up time. After the customer receives our confirmation email, mentioning the meeting point and the phone number of our manager, any change to the booking shall be directly agreed with the manager by calling the phone number reported on the email. 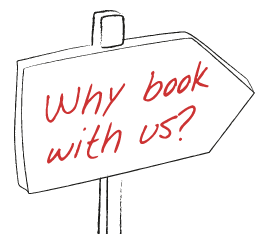 In case of our need to cancel the customer's booking, we will inform him as soon as possible by email and, if possible, we will suggest him other applicable options. Pursuant to the EU directive 2003/20/EC children must sit in suitable child seats until they are 135 cm tall or until they are12 (whichever they reach first). After they shall be obliged to wear adult seatbelts. The driver shall be responsible to check that children are properly restrained. However, licensed vehicles are exempted, therefore they are authorized to carry children even if not equipped with suitable child seats. In order to ensure the best service and vehicle according to the customer's need, please inform us about any big luggage or special items (odd shape, heavier or bigger than usual, including, but not limited to: strollers, wheelchairs, scuba dive equipment, bikes, golf bags). The customer shall be held responsible for any eventual expenses for additional or different vehicles which will be necessary to carry excessive luggage or special items , which have not been reported on the booking form. www.cataniaairporttransfer.com shall not be held responsible for any delay, modification or cancellation due to unforeseeable events beyond its control, such as accidents on the transfer route, normal or heavy traffic, acts of terrorism, strikes, police checkpoints, extreme weather conditions, detours, natural disasters, road maintenance, etc. Trademarks, copyrights, and all other intellectual properties of this website have been granted to Catania Airport Transfer and are protected by the national and international regulations governing the intellectual property. Any use of these contents by third parties for any purposes other than booking transfers is prohibited, including modification, subsequent publication and total or partial reproduction or representation without the express consent of Catania Airport Transfer.